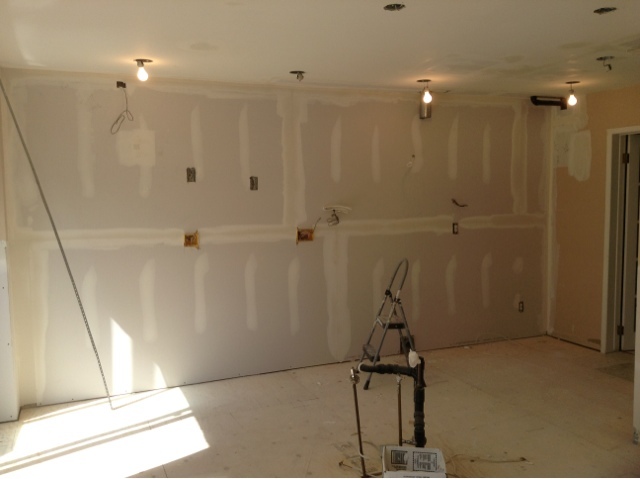 Just Fork It: Kitchen Reno(vation) 2013: Day 4 - Surprise! The team (Toma and Brent on tape and mud, Jamie on paint- SURPRISE!!! painting wasn't on the schedule today) showed up early in the morning, and got right down to work. End of first day of mudding. Huge difference! I pointed out all the existing lumps and bumps that I wanted Toma to flatten out, and he and Brent got right into it. I might have scared him, just a wee bit, with the prospect of fixing the walls in the powder room, but he took it in stride. And he basically re-plastered a wall and a half in there. If you are considering wallpaper as a décor option, stop. Just stop right there. I don't care what the application method is, what the paper is made of, what you learned in the Home Depot training class on Saturday. your future self will thank me. 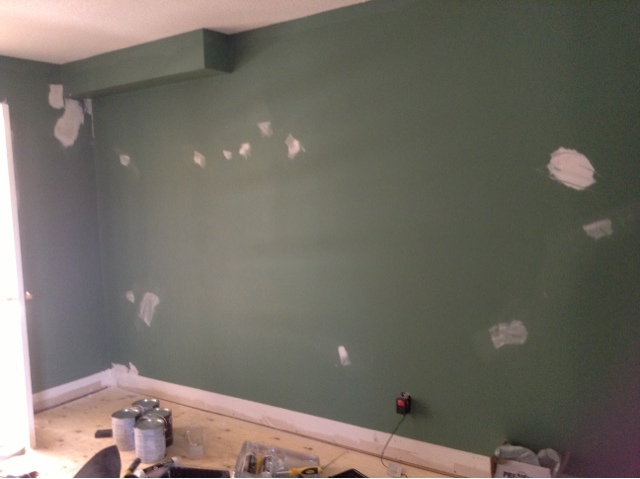 Meanwhile, Jamie started out with a drywall knife and some pink-turns-white spackle, and attacked the house like chicken pox on a four-year-old. Upstairs, downstairs, along the stairs, the man was everywhere. I don't think he took lunch, maybe a smoke break?... naturally thin people are like that, so I hear... go figure. He wasn't even supposed to be here today, but finishing quickly at another job freed him up and our contractors seized the opportunity to get ahead of the schedule. Anyway, the mudders finished around 11am, and since the compound needs to dry, they left. 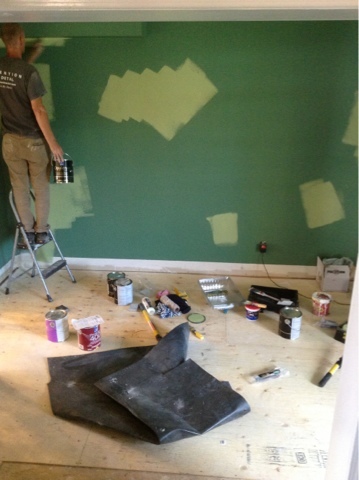 Jamie, aka rockstar-of-day-4, stayed until about 4pm, and painted everything that he could get his hands on! 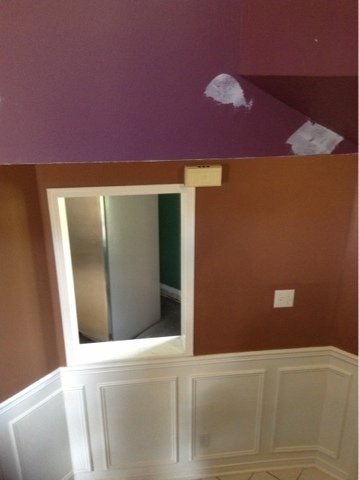 He managed to get 2 full coats on the hallway downstairs, and 1 coat on all of the dining room, as well as hitting up some of the white trim and wainscoting (hard to tell, but in person, it looks much fresher). 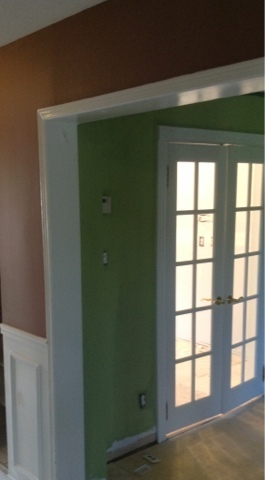 pre-pre-preview of view from hall with 2 coats of new color in the hall and 1 coat in the dining room. There is still MUCH to do, and hopefully they'll make good progress tomorrow on Day 5, before a long weekend here. 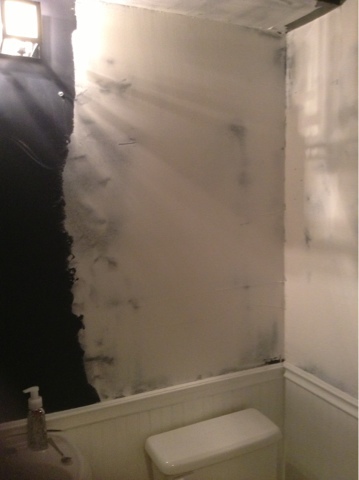 Day 5 will bring us a 2nd coat of mud, and maybe sanding in the afternoon, and definitely more painting. 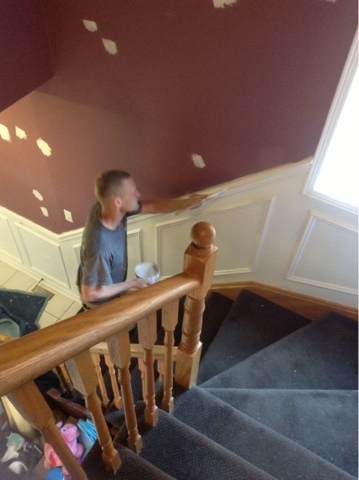 Since Jamie didn't know he was coming here today, and what that entailed, he didn't have the ladder(s) he needs to be able to paint the high ceilings along the stairs. But he'll be ready tomorrow, and I bet he earns rockstar status again. Hi Soren! You have a really great site! I'm glad to have stumbled upon it! I was wondering if you feature guest postings. Thanks and have a great day! I've never considered guest postings... sounds like it could be fun :) I have a few more to do as we wrap up this reno, and then I'll get back to focusing on food and my experiments, reviews, etc. Email me if you have a post idea that you want to write and we'll discuss.